A slow-release watering bag filled with water. You know to give your trees 25 gallons of water per week, but how do you get the water to them? Here are some tips for moving water to trees this summer. Use a hose. If you have one of these connected to a water supply you're in great shape. Conquer any distance by attaching hoses together. Get creative. Use old buckets or water cooler jugs to transport and pour water. Carry water in a wheelbarrow or wagon. Hand-propelled vehicles lighten any load. Use teamwork. If you work together, you can accomplish a lot more. 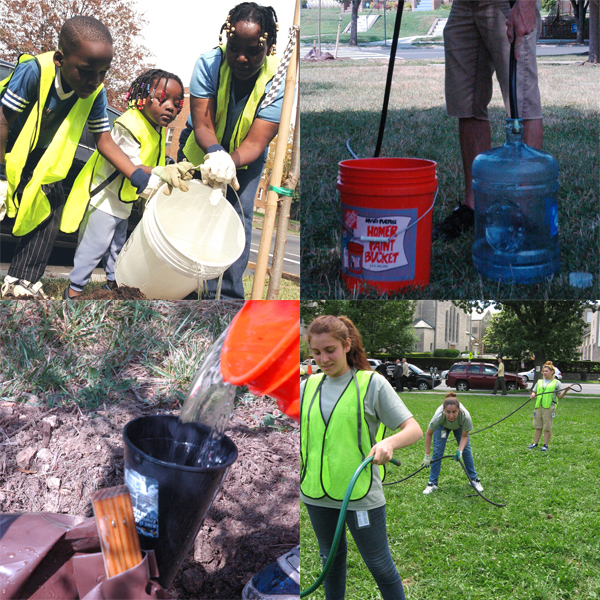 Bring your friends or your family along to help you water trees. Install a slow-release watering bag (such as an Ooze Tube). Use bags that hold the recommended 25 gallons of water. Watering bags can be purchased at most home improvement, garden and nursery stores. Use a funnel. Funnels effectively pour water into watering bags and reduce waste from spilling. Turn a hose on a low trickle for half an hour. If you don't have a slow-release watering bag, set up your hose to run on a low setting. You can stick around or walk away, but remember to turn the water off after you are finished so that you don't waste water or over-water the tree. Make your own slow-release watering device. Add holes to the bottom of a bucket and place at the base of a tree. You can fill it up and then walk away. Our watering tips in action. Remember to take care when watering trees, especially young ones. They will need 25 gallons of water per week on average, delivered slowly and carefully. Street trees in your neighborhood may also need water as they tend to not have much permeable ground nearby to gather water for their roots. It is the responsibility of residents to take care of watering street trees near their property. Ready to water your trees? Take the 25 to Stay Alive Pledge and receive a rain gauge to determine whether your trees are getting enough water. 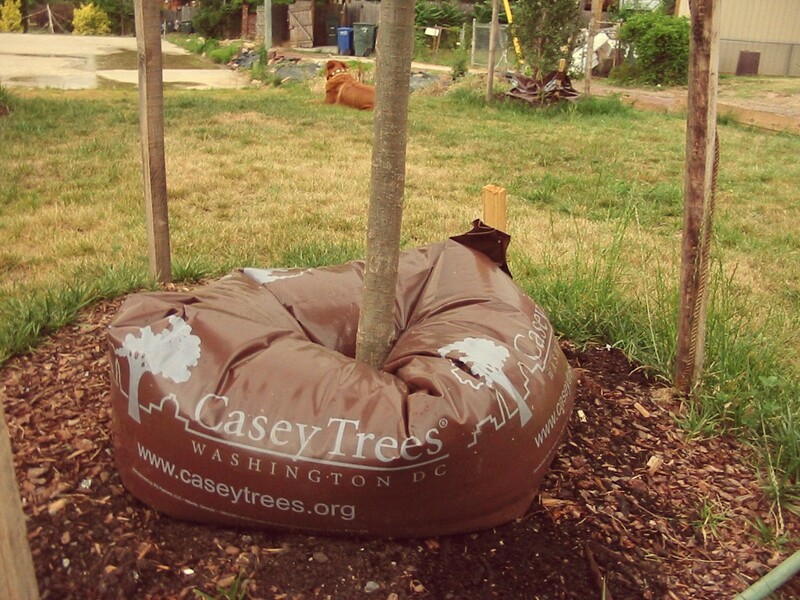 We send them free to anyone who signs the pledge and lives within 25 miles of Washington, D.C. Casey Trees announces the watering recommendation for the coming week every Monday morning to let you know how much watering is needed. If you need a quick update on the current watering conditions, visit our homepage (this week it is very hot, so your trees need the water!). Follow us on Facebook and Twitter for regular updates on tree watering and other news from Casey Trees.